Edradour Scotch Whisky Distillery was built around 1837 and is in the Highlands region of Scotland. 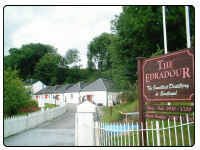 This distillery is still producing whisky today with the main bottles being Edradour aged 10 years. This distillery is also the smallest distillery in Scotland and could be the smallest legal distillery in the world. If you would like to see local accommoadtion near this distillery for your whisky trail please visit the page on this site for the Accommodation near Edradour Scotch Whisky distillery.